The Friends of the Worth Public Library is a volunteer non-profit organization. It is open to all patrons interested in the promotion of good library service. Membership forms are available at the Circulation Desk. Members are not required to attend meetings or do volunteer work. The Friends of the Worth Public Library sponsors an ongoing book sale located in the library foyer. In the past, the Friends have raised enough money to donate an outdoor book drop, additional shelving and many other items. Support the Worth Public Library Giving Tree! The Board of the Worth Public Library invites you to support our library by purchasing a leaf for our Giving Tree. 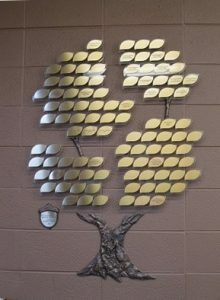 Adding a leaf to our Giving Tree is an ideal way to honor your family, memorialize a loved one, celebrate a milestone or pay tribute to a business or organization. Each leaf will be engraved with your personal message. All donations will benefit the Worth Library and our efforts to continue to expand and improve our offerings to the community.